NETWORK FINALS: After adjustment for NFL preemptions on ABC, DANCING WITH THE STARS and THE GOOD DOCTOR both lost 0.1. In addition, there were several adjustments at CBS: THE BIG BANG THEORY and ME, MYSELF & I up 0.1, and 9JKL down the same. Elsewhere, THE VOICE and LUCIFER rose 0.1. CABLE HIGHLIGHTS: ESPN’s MONDAY NIGHT FOOTBALL dominated Monday cable, but at 2.89 it was down a striking 0.82 from last week’s game. It can’t be attributed to Fox Sports 1’s ALCS baseball playoff game at 1.28, since that was only 0.04 higher than last Monday’s game. On VH1, there were two installments of LOVE & HIP-HOP at 1.18/1.13, compared to last week’s 1.10, and then MARTHA & SNOOP’S POTLUCK DINNER returned at 0.66. 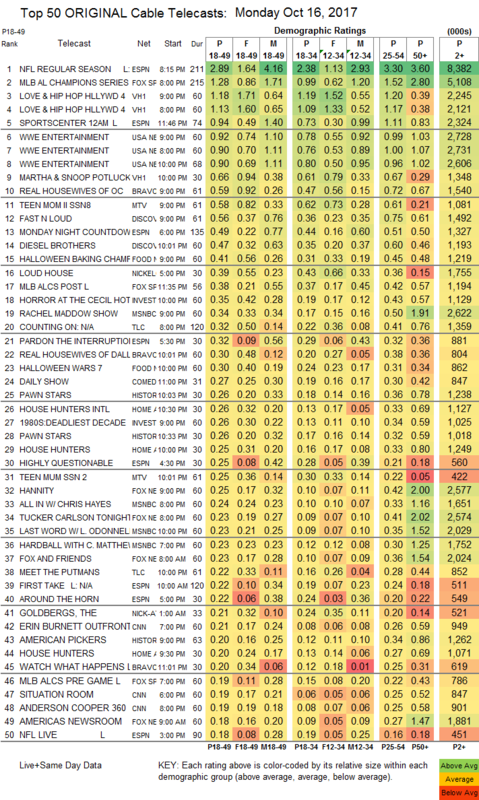 On Bravo, REAL HOUSEWIVES OF ORANGE COUNTY dropped 0.08 to 0.59, and REAL HOUSEWIVES OF DALLAS was steady at 0.30. USA’s WWE telecast was at 0.92/0.90/0.90, compared to last week’s 0.99/0.97/0.93. On MTV, TEEN MOM dropped 0.08 to 0.56, and TEEN MUM was down 0.02 to 0.25. On Discovery, FAST N LOUD returned at 0.56, and DIESEL BROTHERS was up 0.05 to 0.47. 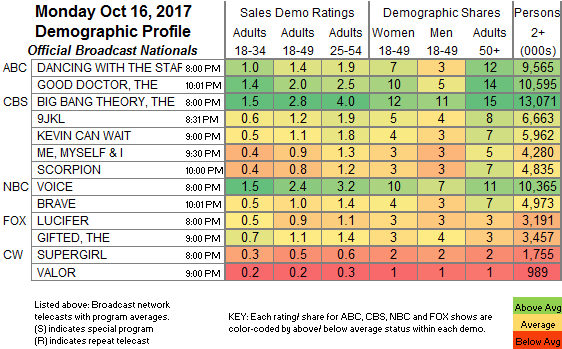 On Food Network’ HALLOWEEN BAKING CHAMPIONSHIP rose 0.04 to 0.41, and HALLOWEEN WARS was up 0.06 to 0.30. Nickelodeon’s late-afternoon LOUD HOUSE was at 0.39. On ID, MURDER AT THE CECIL HOTEL arrived at 0.35, and 1980S: DEADLIEST DECADE at 0.26. MSNBC’s RACHEL MADDOW SHOW led cable news at 0.34/0.50/2.6M, over Fox News’s HANNITY at 0.25/0.42/2.6M, and CNN’s ERIN BURNETT OUTFRONT at 0.21/0.26/900K. On TLC, COUNTING ON edged up 0.02 to 0.32, and MEET THE PUTMANS was up 0.03 to 0.22. On History, PAWN STARS was at 0.26/0.26, and AMERICAN PICKERS was at 0.20. On HGTV, HOUSE HUNTERS INTL gained 0.02 to 0.26, and HOUSE HUNTERS ticked up to 0.26. Spike’s COPS dropped 0.04 to 0.16.